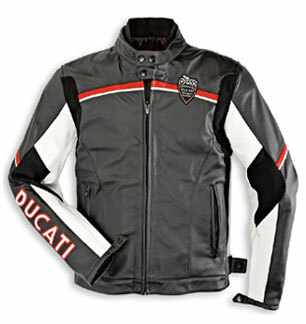 The Ducati Meccanica leather jacket has been restyled to give it am innovationg, eye-cathing new retro look. It includes elastic fabric inserts on the armholes and arms to facilitate movement and riding comfort. The legendary look comes through in the shield trademark over the heart overlapped by two colored bands in red and white, also repeated on the sleeves and back. These two colors, along with black, make up the color scheme of the Meccanica 2011 line. The right cuff and back bear the logo, which is laser cut and stitched on. Also available in a ladies version. Style, tradition and passion. Stretch fabric inserts in the armholes, adjustable side fastenings for the perfect fit. Also available in women's version.